The first thing I need to let you know about Aybla is don’t cave to peer pressure. I caved. My eyes were bigger than my stomach and they only good thing that came out of it was left overs. My husband and I went down for lunch the other day and decided we were going to do it food cart style. There are quite a few pods in downtown Portland, but after going through all the food carts we both settled on this one. 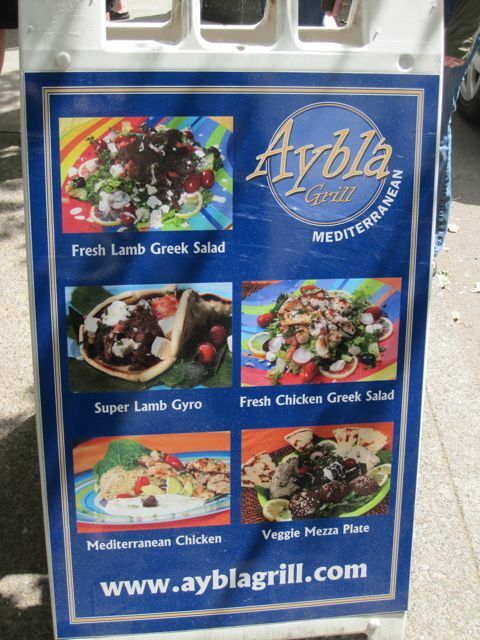 Aybla, which serves authentic Mediterranean food. I love Gyros. Well, good Gyros that is. Aybla did not disappoint. Wow! First off we ordered the Super Lamb Gyro, when we should have ordered the regular one. The picture does not do it justice. This gyro was huge. (Not sure if the regular gyro would have been smaller or just didn’t have the feta in it.) If it was just the feta, then it was worth the extra money. Perfect extra balance of saltiness from the feta. The flavor was amazing. It was spiced well, but not over the top and the pita was super soft. The fresh tomatoes were awesome and the tzatziki was so good. The next day I heated up my leftovers, which happened to be almost half, and it was still amazing. 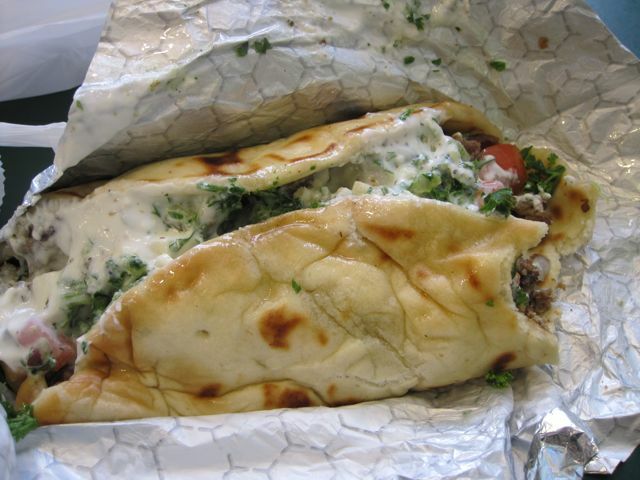 The pita was extra moist and the meat even more flavorful. My husband and I both shared the left overs. It was that big. We also grabbed the hummus plate, because we like hummus and wanted to try one more thing. They give you a ton of hummus, but only 4 pita wedges (or one whole pita). We dipped our pita and had so much hummus left over. Of course we took it home and had it with chips and veggies the next day as well. The Super Gyro was priced at $8, but we could have gotten off a lot cheaper had we chosen the regular gyro. I would love to try a mezza plate next time just so we could try lots of different things, but to be honest it will be hard to go back and not get the gyro. 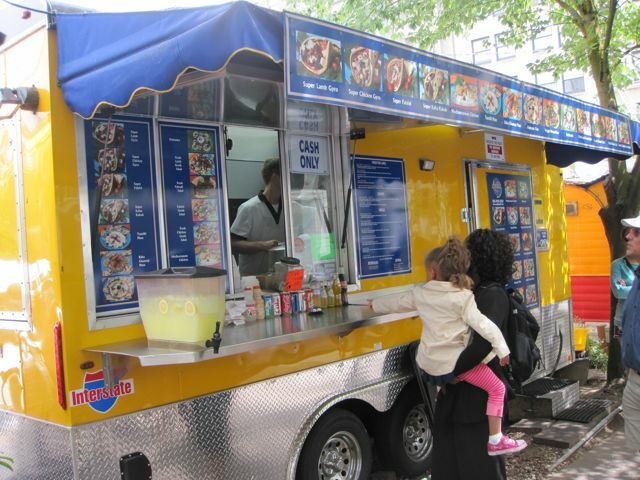 Atmosphere was a typical food cart location. There is some seating around, but be prepared to take it to go or until you find a seat. Pricing was great. Super affordable and large servings. Located in Downtown Portland and also on Belmont.